The Department maintains Administrative, Patrol and Investigative divisions. Community policing and crime prevention are stressed through Neighborhood Watch Programs and other programs and events such as National Night Out. 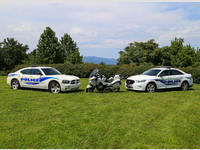 The Department is involved in the schools by maintaining a School Resource Officer at East McDowell Junior High School. The Department provides property checks for residents and business checks for businesses in the City Limits. The Police Department building is located at 270 South Main Street.